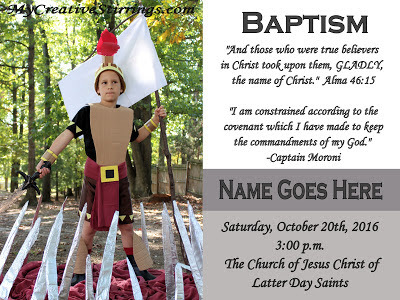 My son is turning 8 and getting baptized so I decided to photograph him as his favorite scripture hero. We all had a blast re-creating this scene and the kids were very excited to help make the outfit, it only took about 3 hours from start to finish [and may have taken even less without the kids help =)]. Congratulations "Name Goes Here"...just kidding, Tommy! I made this costume out of cardboard boxes, many pillowcases, sheets, aluminum foil, construction paper, tape, clothes pins, and staples :). If he moved too much everything would pop! I love this! What a handsome little scripture hero! What did you use to make the helmet? I'm trying to make a medieval night costume for Halloween for my 3-year-old, and I think that helmet looks great! I made the helmet by taping yellow construction paper onto a brown knit hat. I think it would have held up well for many hours. I taped the feather thing-a-ma-bob onto the top of the hat. This portion was VERY unsturdy.